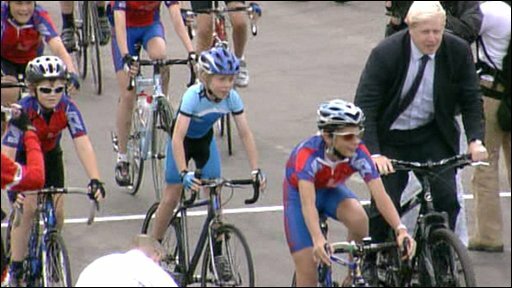 A cycling centre has been opened in east London which the developers say is the "first piece of physical sporting legacy" linked to the 2012 Olympics. The £4.5m Redbridge Cycling Centre replaces the Eastway Cycle Circuit which was demolished to make way for the VeloPark for the London Games. The new 2km (1.2 mile) circuit, built by the London Development Agency (LDA), is for community and competition use. Opening the centre, mayor Boris Johnson said it was a "breathtaking facility". Mr Johnson said: "The great thing about cycling, set aside the exhaustion, is that it is wonderful exercise and this is a breathtaking facility... it's a fantastic site." He added: "One of my key ambitions as mayor is to see London become a real cycling city by encouraging the estimated 1.1 million Londoners who own bikes but don't use them regularly to get back in the saddle." Kate Hoey MP, Commissioner for Sport in London, said: "It's great because all the young people who have been watching and excited by our Olympic medals will now have somewhere to come to that they can actually try to mimic those wonderful athletes." Ms Hoey said it was the "first real tangible benefit" of the Olympic Games. "Londoners want to see facilities improved, it's not good enough just to have a great three-week spectacle," she added. British Cycling spokesman Simon Lillistone said: "A traffic-free facility like this is great for them (children), is great for competitive cycling and great for the local community." The VeloPark will return to community use after 2012, the LDA said. Meanwhile, Mr Johnson said the success of young Britons at the Beijing Olympics contradicted the idea by Tory leader David Cameron that Britain was a "broken society". Writing in his weekly column for the Daily Telegraph, the mayor said the notion was "piffle".